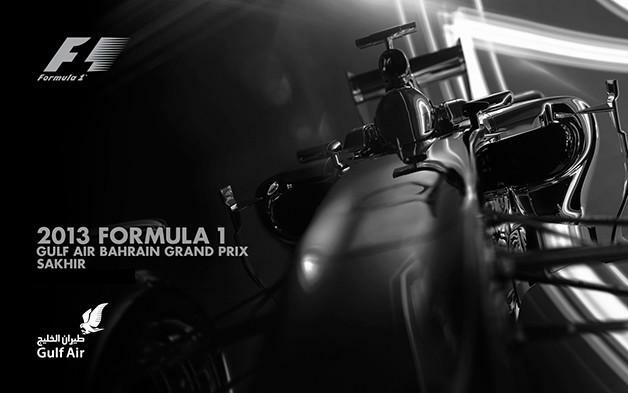 28/10/13 Round 2: 2013 FORMULA 1 GULF AIR BAHRAIN GRAND PRIX: Round 2 takes the teams to the hotly desputed country of Bahrain that has seen more than a few close calls over the years, both on and off the circuit. This race marks the 100th race for the XFOC so the Mercedes team will be looking to get themselves up to full tempo here so they can assault the championships. 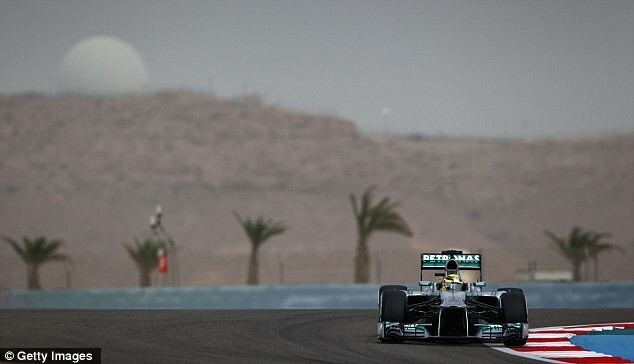 Entering qualifying for Bahrain, the Mercedes team felt pretty confident of a good pace after early numbers came out and Midnght LMR was in pole on Prime tires (the slower of the 2 compounds). As the session wore on, teammate BlueJaBBR, took pole and with Midnight in third, just tenths off 2nd place. Then the Mercedes strategy started to show itself as the rest of the field switched to the option tires (soft) and started pressing faster and faster, both Mercedes drivers put on fresh prime tires and put in single hot-laps that would see them start 2nd and 4th with the freshest tires in the field. 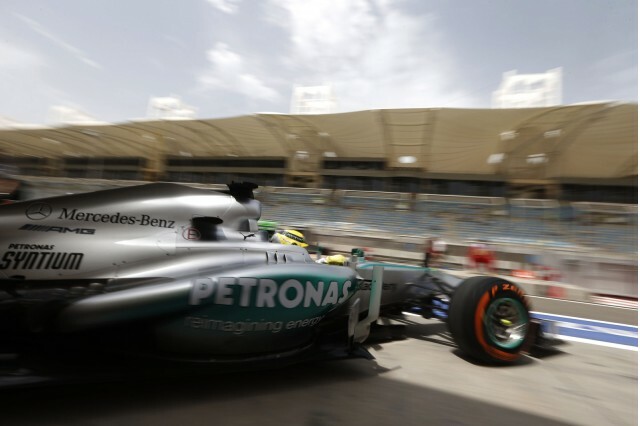 This single decison would lead Mercedes to its best race result so far. Qualifying results were XTheMuffinM4Nx on pole with BlueJabbR 2nd and Midnight in 4th. The race looked very bright for the LMR Mercedes AMG squad as both drivers had only done one qualifying lap on the harder (longer lasting) prime tires and would be able to switch to the option tires later in the race when the fuel load would have burned off and the car would be lighter and easier on the tires. 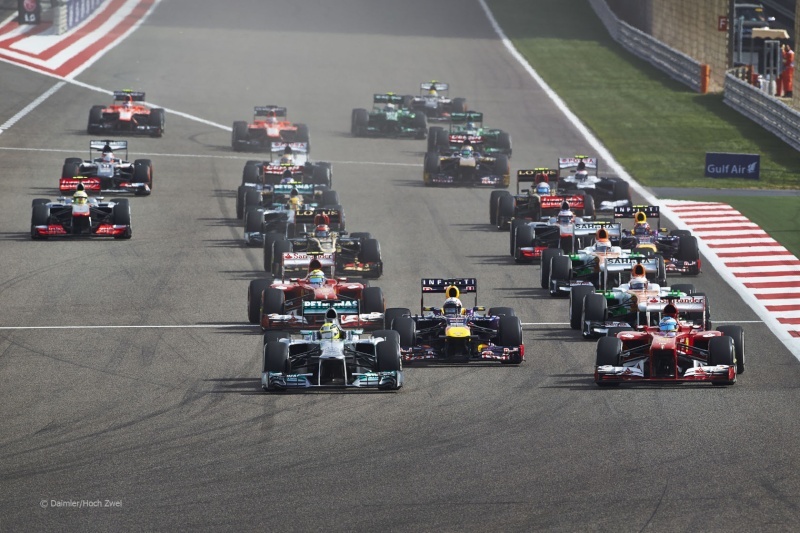 So with that, the lights went green and the second race of the 2013 XFOC season commenced but unfortunatly the great setup only went so far. The start of the race saw another great start by Midnight LMR as he moved from fourth into a side-by-side battle for 1st going into turn one. Being as the other car was his teammate, BlueJaBBR, Midnight let off early to give the corner to his teammate and defend the Mercedes lead against the approaching field. Unfortunalty the Williams of AppleGuy2011, ran too deep into the braking zone and ran into the back-end of the Ferrari of FireBlade9696 which caused a ricochet effect into the back-end of Midnights Mercedes. The resulting force pushed Midnight up alongside BlueJaBBr's and the four cars went off the track on the outside of turn 1 leaving Midnight a damaged front end plate, flat spots on all four tires and the Mercedes team scrambling to get back on track. "It's a gods wonder we didn't wreck any cars out in all that, that was rookie driving" Midnight told the FIA review board after the race. Once back on track and damage accessed by both drivers, the Mercedes team realized what a monumental task they would have now to get back to the podium. So the two riched their fuel and set off after the competitors. Unfortunalty only a few laps later the #10 Mercedes would have to pit for repairs and new tires after Midnight was losing time to his teammate and it was determined the strategies could be adapted to the new situation. BlueJaBBR then became a man possesed as he hit his pit marks a few laps later and put on option tires and started pounding out fastest lap after fastest lap. 2 in a row and 4 total times in 6 laps, the #9 Mercedes would push his way further to the front, finally taking the lead and then in his final pitstop, he began to make himself a comfortable margin as noone in the field could match his pace and he started dropping into quailfying times as the car became lighter and lighter. Meanwhile, after battling feircely with the Ferrari of FireBlade9696 and by Ferrari academy driver, Manz like Chaz, driving the Sauber, Midnight was finally able to work his way into 4th spot. The works driver spent a third of the race stuck behind the, very defensively driving, pair and would now not have the tires to challenge for a podium positon. So the Mercedes team strategy once again changed as the team decided to secure the positions they had in an effort to impact the championship without further risk. The two works drivers finished out the last third of the race in a clean and neat order, setting consistent lap times all the while Midnight continued to pull away from the struggling Ferrari, eventually finsihing the race 51 seconds ahead. 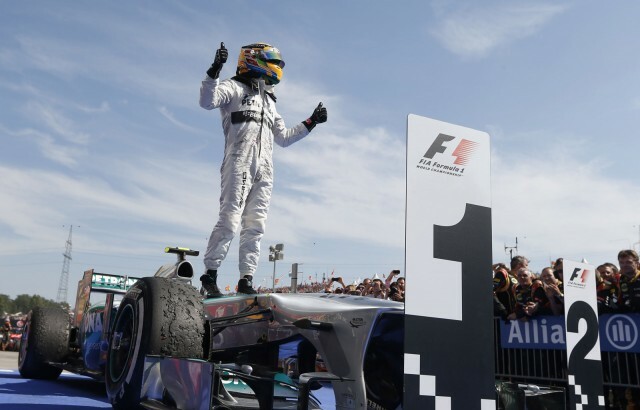 A special note needs to be mentioned that not only did BlueJaBBR secure LMRs first victory in Formula 1 but also the first victory for Mercedes since 2011 and, since this was the 100th grand prix for the XFOC, he took Mercedes to a new record. The german team took pole at the very first race of the XFOC back in F1 2010 at the hands of retired works driver, Jakey Style and now BlueJaBBr would take that heritage to the teams win in the 100th Grand Prix. 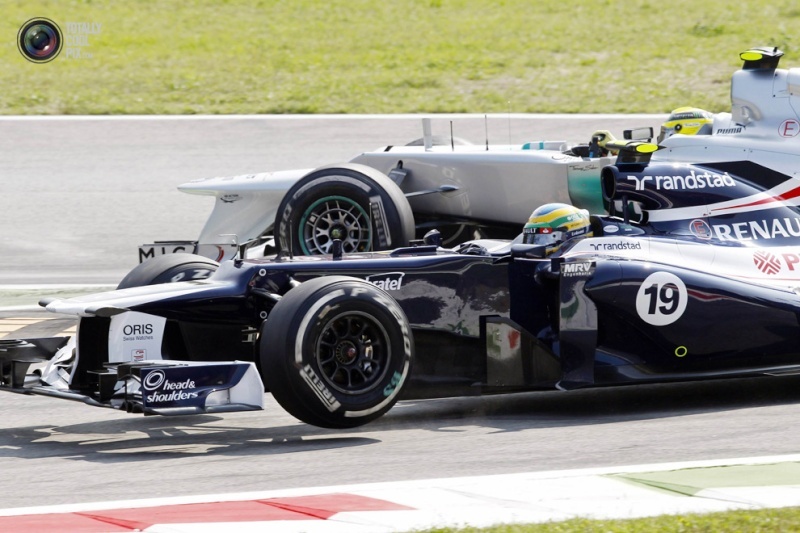 So a huge congratulations to BlueJaBBR for his first win of the 2013 season and to the Mercedes outfit as a whole. "I am very happy with our finishing positons espeacially given the events of turn 1" BlueJaBBR was quoted as saying after the race. The FIA is hosting an active investigation of AppleGuy2011s actions both in turn 1 and in another event during the race. He is expected to be penalized for his actions. Also with the results here it moves Midnight into first place in the drivers championships with BlueJaBBR tucking into 3rd and the Mercedes outfit 11 points off Ferrari for 1st in the Constructors. An incrediable recovery for the team after the first corner incident.